When it comes to winning millions of dollars when playing a slot game online, there is one game that has produced more millionaires than any other. Mega Moolah is a progressive slot game that has a base jackpot of $1 million, and often rises up into the multi-million range. It is not a new game, Mega Moolah has been around for a few years now and it is still one of the most played games in any online casino, all because of the huge jackpot it has. The ability to create instant millionaires is a very alluring factor, which is why all the better online casino sites want to ensure that it is included on their virtual casino floors. One of the best things about the Mega Moolah slot game is that you do not have to be playing the maximum bet in order to win the top progressive award. There was one gentleman that actually won over $5.5 million while playing $0.50 a spin. So it opens up the machine for people of all levels to play. In recent months there have been two Canadian instant millionaires created from them hitting the jackpot on the Mega Moolah slot game. The first one was a lady whose casino initials are I.R. She was playing Mega Moolah on her iPhone while round at her mother’s house, and she hit the Mega Moolah bonus round and decided to go for a quick toilet break while the bonus round played. 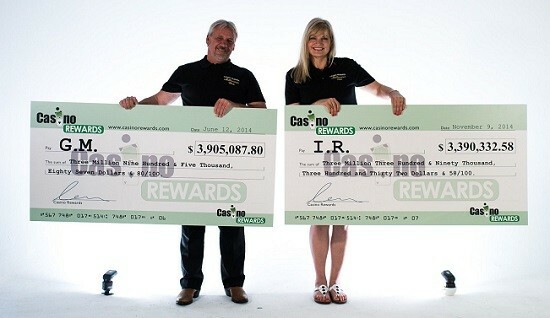 When she can back to her phone she was amazed to see she had won an incredible $3.3 million (USD). She won this playing at Golden Tiger Casino, and she has said that it has changed her life for the better right away, as she has now purchased a new house, and new SUV and has also donated some money to a local animal charity. Then there was a gentleman who’s casino initials are G.M. that won a massive USD$3.9 million on Mega Moolah while playing at Quatro Casino. What makes this even more incredible was that he was actually playing Mega Moolah with a bonus that was given to him by the casino! This win has allowed G.M. to quit his job and start up a new business, so it was certainly a life changing moment for him as well. The most impressive and famous win of all time for Mega Moolah, in an online slot game also came from Mega Moolah back in 2015. Jon Heywood holds the Guinness World Record for winning the highest amount of money ever in an online slot machine, which amounted to a whopping £13,213,838/$20,066,800/€17,880,900 won from the Mega Moolah. When you consider the fact that he had bet only 25p while spinning the wheel, it isn’t hard to imagine the overwhelming sense of delight that he must have felt at the time! As well as the four different progressive jackpots inside Mega Moolah, the game also offers other features too. 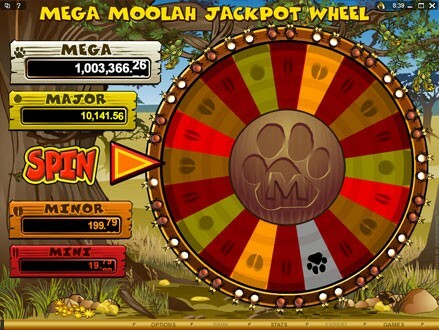 You can activate up to 15 Free Spins on Mega Moolah (as soon as you get three fortune teller monkey symbols anywhere on the reel) within the game, and you should also look out for the Lion symbols landing on your reels too in the Mega Moolah game, as these are wild cards that can pay out a lot of money (up to $15,000 if you get 5 of them). If you are lucky enough to land 3 or more scatters (Monkey) and get access to the 15 free spins, anything that you win will receive a 3x bonus during each one of the 15 spins in Mega Moolah. Do keep in mind that Mega Moolah is also available in an American theme, an Egyptian theme and even a dedicated Holiday theme, that is the beauty of Mega Moolah. The core concepts of Mega Moolah remain the same, but the feel, music, sound and symbols of Mega Moolah all change according to the theme you are playing. This ensures that players never get bored while playing Mega Moolah. The Mega Moolah wheel itself has 20 pieces on it and each of those pieces are colour coded to signify the jackpot it represents. Before you start spinning the Mega Moolah wheel, bets can be adjusted between 0.01 – 0.05 coins with the + or – buttons that you will find at the bottom left corner of your screen. To just select the maximum bet possible right away, there’s a dedicated “Bet Max” button as well. Mega Moolah also has an auto play feature to save players the time and effort required to press the Spin button every time. Just go to “Expert,” select “Auto Play” and set the number of times you want the wheel to spin Mega Moolah automatically, without needing manual intervention from the player. So, the game of Mega Moolah is a lot of fun to play, and gives the player a lot of different incentives to keep them entertained as they play or even take a break while the wheel keeps spinning. There have been many more instant millionaires created from playing the Mega Moola​​h slot game all around the globe over the last few years, and there will be many more created in the future too. 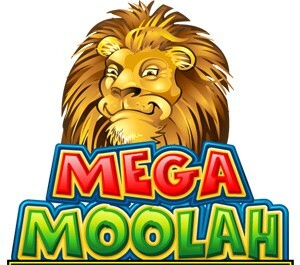 Until there is a new Mega Moolah game that is produced that has a jackpot that can rival Mega Moolah’s for sheer size, then the game is likely to remain a firm favourite with players and online casinos such as Zodiac Casino for a long time to come.